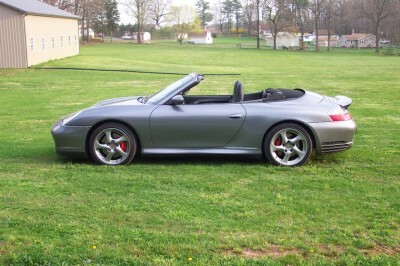 The 2004 Carrera 4S Cabriolet features a 3.6-liter six-cylinder engine that can push the cloth-topped car to a maximum track speed of 174 mph, matching that of the current 911 Carrera 4S Coupe. The Cabriolet accelerates to 62 mph in just 5.3 seconds, two tenths of a second slower than the Coupe. This is commendable given the additional 154 lbs. in weight carried by the Cabriolet.